Why aren't there more unisex kids' clothes? Get rid of gender stereotypes. 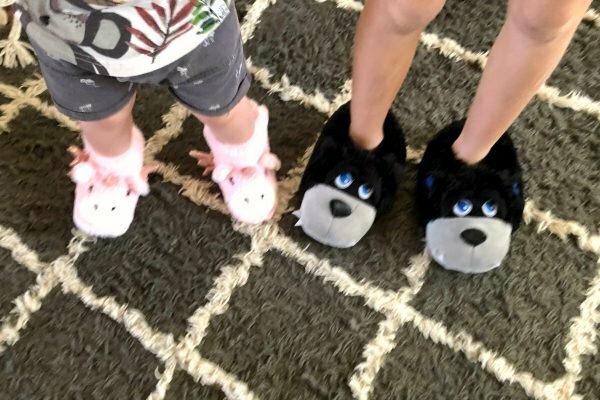 As the cooler temperatures made us all feel a little chilly this week, I had the seemingly simple task of going shopping to buy my boys some slippers. I knew that my older son Toby would be fine with the dull, dark coloured offerings in the ‘boy’ section of our nearest department store, but for my toddler son Leo, I felt conflicted. 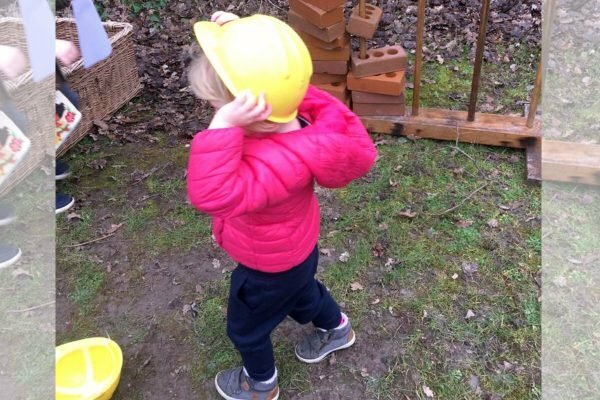 Leo is only two-years-old and while he loves dinosaurs and cars, he also loves bright colours, Peter Rabbit, playing dress-ups and Maisy Mouse. Some of our favourite celebrities share their opinions on parenting. I looked pretty hard and yet all the boy branded slippers I found were either in dark colours or had the aggressive faces of monsters or bears. Boys are apparently only allowed unicorns if they are angry-faced and grey in colour. By comparison the girl branded slippers were in candy colours and if they had faces, they were passive and smiley or worse, asleep. After what seemed like a ridiculous amount of soul searching around buying my son ‘girls’ slippers, I settled on a pair of soft pink and white unicorns. Leo unsurprisingly adored them, smothering them in kisses and cuddles at home. 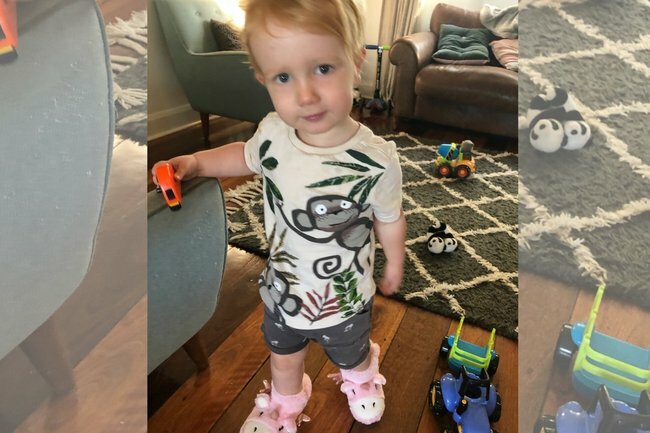 While discussing this gendered footwear phenomenon, a friend Katie in the UK told me about her mission to find daughter Amy some practical shoes. She described how the girls’ versions were “pink, covered in sparkles, sequins and had ribbons rather than Velcro fastenings”. She ended up buying her daughter the boys’ ones, which while grey in colour, were described as ‘sturdy and waterproof for active play’. “There is a place for sparkles, pink and fun – I don’t want my girls to be sneery about ‘girl stuff’ and Amy certainly loves a glittery unicorn," says Katie. "It’s just that I believe all choices should be available to all children. What annoys me most is that the messaging around boys’ clothing implies agency and action, where the girls’ stuff is about looking nice." "It’s just that I believe all choices should be available to all children," says Katie. Image: Supplied. Clementine goes on to reference Sandra, a face painter in the US, who’s Twitter post went viral. Sandra posted about how sad she felt after seeing a four-year-old boy reprimanded for wanting to have a butterfly painted on this face. His dad insisted he get something ‘for boys’ instead. “When I read stories about little boys who have their softness and love shamed out of them by parents who are in thrall to their own fear, my heart breaks,” says Clementine. A 4yo boy asked me to paint a blue butterfly on his face. Then his mom told me "no, he doesn&apos;t want that." I&apos;m sorry that he was shamed for wanting to share in the joy that is the miracle and wonder of nature. Rachel a mum of two boys in Newcastle told me how when she took her sons shopping for toys or clothes she told them they could pick anything they liked from the ‘children’s section’. “Now that they can read, all my good work has been undermined!” says Rachel. Thankfully all hope is not lost for parents who don’t want to restrict their children to dressing ‘like a boy’ or ‘like a girl’. Two designers in the US behind gender-neutral clothing company for girls Princess Awesome have had huge success crowdfunding to start their male version called Boy, Wonder. On the Boy, Wonder Facebook page owners Rebecca Melsky and Eva St Clair describe in a short video how they surveyed over 4,000 parents to establish there was absolutely a demand for brightly coloured boys clothing that featured rainbows, ice cream, cats and unicorns. “Boys want and deserve a wider range of clothing options,” the women say. I couldn’t agree more. Long may Leo choose to wear his fluffy pink unicorn slippers with pride. How do you feel about gendered clothing choices? Do you feel retailers have a responsibility to let kids decide what they wear rather than making it so simplistic?